Over Christmas I became an iNerd. And my newest obsession? The Angry Birds. I have become one of those people who is constantly whipping out her iPhone to play this game. Ironically, real life birds are numero uno on the “List of Ridiculous Things Christen is Scared of”. Number two, you ask? Hot Dogs. 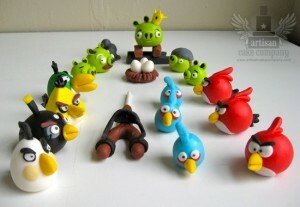 Anyway…you better believe with my new iNerdom I flipped out when I saw Edible Angry Bird Cake Toppers. Oh yeah, I went there. You can buy the entire set here at the Artisan Cake Company’s Etsy store. You can also buy them in smaller sets for as little as $15.00. The large set includes twenty-four edible cake or cupcake toppers depicting your very favorite angry birds..and pigs..and bombs..and rocks..and nests..I just died. Not only are these little guys adorable..it’s hard to believe that they are edible. They look SO perfect. A little nontraditional for a wedding cake? Yes..but regardless..I love them and I am sure there are many other iNerds out there who will appreciate these little beauties! Thanks to Cakewrecks for mentioning these on twitter!